I always have fresh veggies in the house and wanted something different to snack on during the day. You can make this chunky and top a salad or enjoy a good egg salad sandwich. I chopped mine really small and ate as a dip with my veggies. 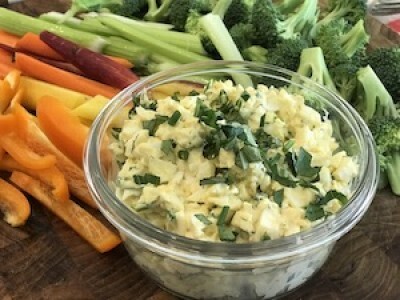 Egg salad is good anyway or just grab a for and eat it out of the container. To make perfect hard boiled eggs: Take a pot and add in the eggs. Cover with water. Put over medium-high heat, cover and bring to a boil. Once the water starts to boil remove from heat and set your timer for 11 minutes. Drain from water and let cool in a bowl. Peel eggs and set on a board. Take each egg and place in a mixing bowl and mash with the back of a fork. Add in mayonnaise, Dijon mustard, apple cider vinegar, basil, chives, dill, garlic, salt and pepper. Mix to combine well with a fork. Taste for any additional seasoning.